This is the Go Song by Have Fun Teaching. 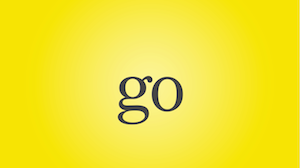 The Go Video is a sight word video for teaching the word GO. The Go Sight Word Video features Doodles going different places. Doodles will go to school and learn, go to lunch and eat with Lexy and Penny, go to the park and play, and go to bed and sleep. The 'g' is hard for my kids to read. It is a good teaching video, but my kids were super distracted telling my the 'g' looked funny. I guess we just have not looked at that font much. I think the children would enjoy this, but would it be possible to use a regular 'g' for the word 'go'? The fancy font is not how students learn to print this letter.